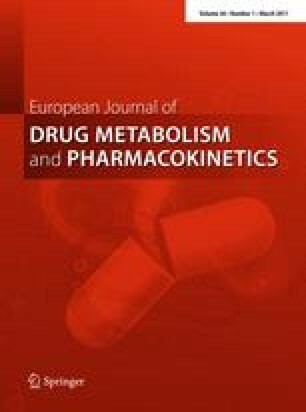 The majority of marketed small-molecule drugs undergo metabolism by hepatic Cytochrome P450 (CYP) enzymes (Rendic 2002). Since these enzymes metabolize a structurally diverse number of drugs, metabolism-based drug–drug interactions (DDIs) can potentially occur when multiple drugs are coadministered to patients. Thus, a careful in vitro assessment of the contribution of various CYP isoforms to the total metabolism is important for predicting whether such DDIs might take place. One method of CYP phenotyping involves the use of potent and selective chemical inhibitors in human liver microsomal incubations in the presence of a test compound. The selectivity of such inhibitors plays a critical role in deciphering the involvement of specific CYP isoforms. Here, we review published data on the potency and selectivity of chemical inhibitors of the major human hepatic CYP isoforms. The most selective inhibitors available are furafylline (in co-incubation and pre-incubation conditions) for CYP1A2, 2-phenyl-2-(1-piperidinyl)propane (PPP) for CYP2B6, montelukast for CYP2C8, sulfaphenazole for CYP2C9, (–)-N-3-benzyl-phenobarbital for CYP2C19 and quinidine for CYP2D6. As for CYP2A6, tranylcypromine is the most widely used inhibitor, but on the basis of initial studies, either 3-(pyridin-3-yl)-1H-pyrazol-5-yl)methanamine (PPM) and 3-(2-methyl-1H-imidazol-1-yl)pyridine (MIP) can replace tranylcypromine as the most selective CYP2A6 inhibitor. For CYP3A4, ketoconazole is widely used in phenotyping studies, although azamulin is a far more selective CYP3A inhibitor. Most of the phenotyping studies do not include CYP2E1, mostly because of the limited number of new drug candidates that are metabolized by this enzyme. Among the inhibitors for this enzyme, 4-methylpyrazole appears to be selective. We would also like to acknowledge the editorial contribution of Ronitte Libedinsky and helpful comments by Peter Fan.